Hello Stampers! Today I have a quick and easy treat bag tutorial to share with you. I had an extra bag that I created the orange stripes using the sponging technique so I pulled it out to decorate it using A Muse Studio's digital papers and dies. I have also created a quick tutorial for you. You can check out this video tutorial that I created showing you how to I did the stripes. 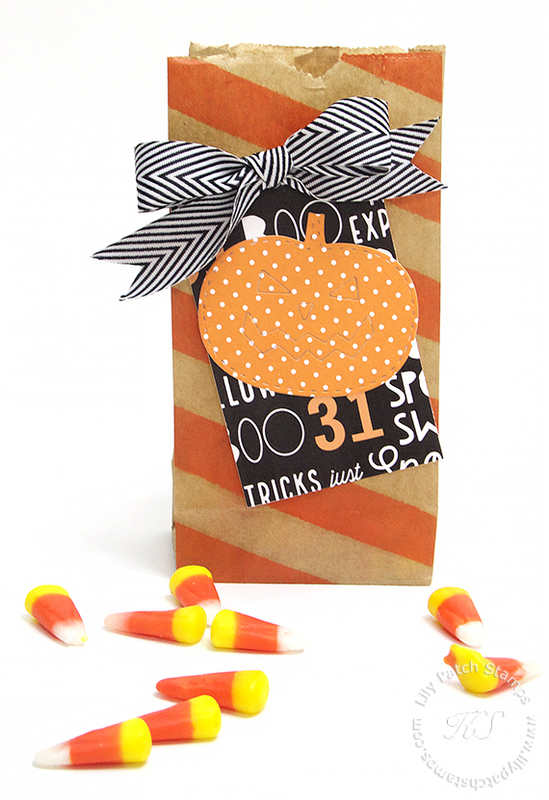 This is a nice size treat bag for all those yummy Halloween treats. Please check out my video below for details. A Muse Studio (kraft bag), Digital Paper kit, Jack Tag die, orange pigment ink, black chevron stripe ribbon. super cute bag, luv the adorable tag...fun ribbon bow and pumpkin! I am so glad you played along with us at simon says stamp wednesday challenge! Oh this is such a cute treat bag! I love it! Gonna go watch your video now. Thanks for sharing with us at DRS Designs! Super Cute! Thanks for playing along with us at Hiding In My Craft Room! Cute tag. Thanks for joining us at Crafty Creations Challenge.